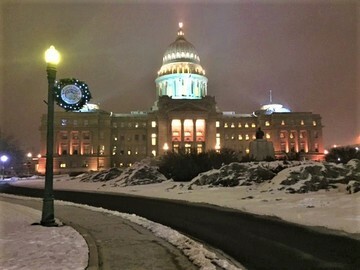 The Capitol building on a beautiful winter morning. 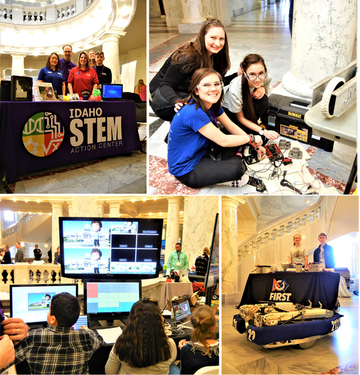 Computer programing and robotic building were just a few of the skills demonstrated during the STEM display this week in the Capitol rotunda. 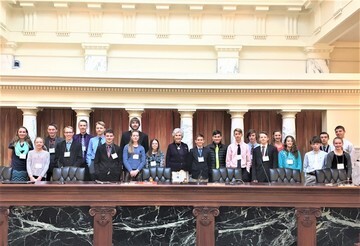 Students from elementary to high school showed off their technology and engineering skills to lawmakers Tuesday in celebration of STEM Matters! — a campaign to raise awareness about science, technology, engineering and math in Idaho. The Senate Commerce Committee approved a significant rewrite of the safety rules regarding logging operations in the state of Idaho. These rules were the result of a collaborative effort between the logging industry and the Division of Building Safety. In the Senate Education Committee Senate Bill 1014 (regarding a school’s technology plan being submitted to the State Department of Education) was held at the call of the Chairman. Senate Bill 1015 (revising definitions and technical corrections) was sent to the Senate floor with a due pass recommendation. 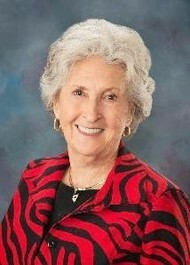 Mary Spiker, of Pocatello Idaho, was named teacher of the year. She shared her concern that economic poverty negatively affects our students’ ability to learn. She also expressed that she has witnessed economic poverty contributing to misbehavior, lack of critical thinking, lack of hygiene and lack of empathy. The Idaho State Capitol had the privilege of being visited by representatives from the Idaho Stem Action Center, Boise State University, University of Idaho, College of Western Idaho, College of Southern Idaho, North Idaho College, Lewis-Clark State College, and the Idaho Parent Teacher Association where the importance of our education system in Idaho was discussed. Senator Patrick chairing the Change in Employment Compensation (CEC) Committee meeting. 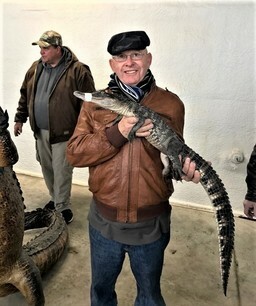 As part of his busy schedule this week, Senator Patrick had the pleasure of touring an alligator farm this week! 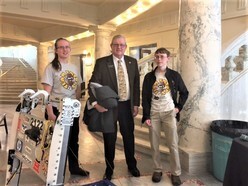 Rep. Kauffman meeting wih robot builders during STEM day at the Capitol. The first tax bill introduced will exempt the first $750 of income from taxation, as well as reduce the top income and corporate rates from 7.4 percent to 7.2 percent. The entire proposal is estimated to provide roughly $51 million in tax relief. 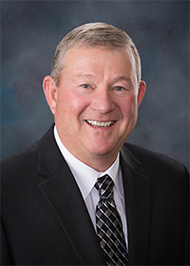 The second bill would bump the exemption on Idaho's property tax on business equipment to $250,000 from the current $100,000. 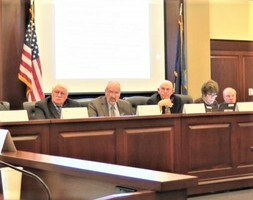 The House & Senate Transportation Committees held a joint meeting to hear the annual report from the Idaho Transportation Dept. and then we toured the new Boise downtown underground bus terminal. It was a great example of a public private partnership. 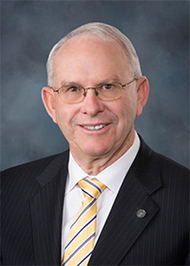 I submitted a bill to revive the recently expired plan that dedicated excess general-fund surplus dollars to statewide roads projects by adding another two years to the sunset. The so-called surplus eliminator had a two-year expiration date on it. My proposal, would give 60 percent of the new money to statewide highway projects, while 40 percent would go to local districts. The previous bill gave the entire surplus to the State system. In visiting with the Cities, one major concern was the cost of proposed water quality standards and with the new Presidential Administration the uncertainty of future regulations. Public invited to offer testimony Fri. morning on health and welfare issues. A large crowd was on hand to testify. Click here for a recording of this meeting. I serve on the Idaho Military Advocacy Commission (IMAC) and one of our priorities is to site the F-35 mission at the Idaho National Guard at Gowen Field in Boise. This supplemental was good news. 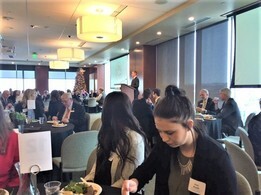 Idaho Optometric Physicians, Idaho Chamber Alliance, Idaho Family Physicians, Idaho Auto body Craftsmen, the Idaho Potato Commission, Idaho PTA, U of I Student Legislator Ambassadors, Idaho Assn. of Cities, Idaho Credit Union Leagues, Boise State, STEM Action Center students and the Idaho State University. Rep. Kauffman meeting with University of Idaho Legislative Ambassadors. 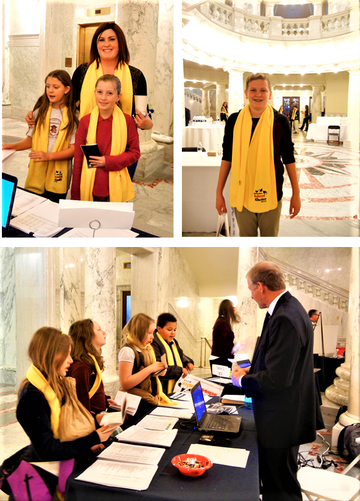 Students from the Idaho Home School Coalition visit with members of the Department of education. These students received a 'Passport to Success' booklet and as they learned about each topic a stamp was placed on their booklet. Some of the topics discussed include: Advanced College and Career Advising, Math Initiatives, Drug Free Schools, Technology Services and more. One of the nicest things that happens each January is the visit from the wonderful home schooled students with Capstone. Every weekday morning, 298,800 children are headed out the door for school! That was the beginning statement by Superintendent Ybarra during a week of education funding hearings. By the end of the week, we will have heard requests for about 68 percent of all the tax money that is used to fund your state government responsibilities. Included in the details of our educational system are student fees, which I am glad to say are among the lowest in the nation. We also receive federal money at almost 300,000 million for special education services and nutritional programs. The part of the education budget that helps offer dual credits or advanced opportunities costs about 7 million a year and will be an item in this budget also. It has made it much easier for parents to pay for higher education. In fact, there are many high school students who now graduate with one or two years of college credits. Along this same line, College of Southern Idaho is committed to helping our high school students realize their opportunity for college. One of their budget items covers counselors and a summer camp opportunity for our young folks to feel more qualified to go on to further education. This coming week will find us helping with the disaster caused by the terrific snowfall. Governor Otter has signed an executive order for disaster relief and we will cut a check for 2 million dollars to help in the damage caused by heavy snow pack or that could be coming with a thaw. One of the new items in all state agency budgets is a shared cost of Cybersecurity insurance. This is not a quick fix to a new and far-reaching threat, but will be an ongoing effort to protect our ever growing technology systems. It was nice to see several city council members, Mayor Davis, and city manager Mike Williams. They were in Boise for meetings and scheduled a visit early on Thursday morning before we started the day’s schedule. The budget hearings continue next week with a study of how we use Health and Welfare and Medicaid funds for those of our citizens who qualify for this needed assistance.